HONOLULU – A six-month paper reduction program piloted by the Office of Enterprise Technology Services has reduced paper use by 20 percent, which translates to a savings of one million sheets of printed paper. The paper reduction program aligns with Gov. David Ige’s priorities for an effective, efficient and open government. One of his goals is to transform government into a paperless and digital process. “Transforming from a paper-dependent culture to a digital environment improves public accessibility to government documents and increases transparency for our citizens. Electronic documents make it easier to store and retrieve documents,” said Gov. David Ige. Nine state departments participated in the limited scope pilot, which took place from January 2018 to June 2018. During the same period last year, more than 4 million sheets of paper were used. One of the ways paper use was reduced was transitioning departments into producing electronic reports instead of printing hard-copy documents. Additional paper reductions and cost savings are expected in the coming months as more departments eliminate many printed paper reports entirely and convert others to digital documents. 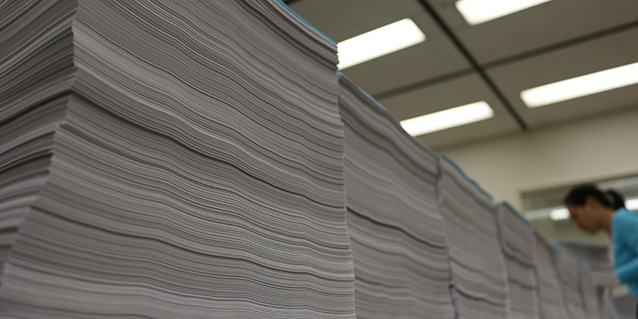 In three years, the State is projected to save $500-thousand and 10 million sheets of printed paper. In his 2015 State of the State address, Governor Ige pointed to the fact that the State goes through about 1 million pieces of paper a month – 12 million pages each year – and committed to helping the state go paperless as a means of transforming the culture of government to embrace and accelerate change. As a State Senator, Ige led the charge for a paperless initiative in 2008, which reduced the Senate’s paper use by 6.7 million copies, a 60 percent reduction in the first year of the initiative. As CIO for the State of Hawaii, Todd Nacapuy leads the Office of Enterprise Technology Services (ETS), which provides governance for executive branch IT projects and seeks to identify, prioritize and advance innovative initiatives with the greatest potential to increase efficiency, reduce waste, and improve transparency and accountability in state government. ETS also supports the management and operation of all state agencies by providing effective, efficient, coordinated and cost-beneficial computer and telecommunication services such that state program objectives may be achieved. For more information, visit ets.hawaii.gov.